Photo of red knot with orange leg flag that was banded in 2010 in Argentina (per Patricia González). This individual was resighted on 17 occasions in Georgia, and was seen each spring during the 2013, 2015, and 2016 seasons. Photo of red knot with orange leg flag that was banded in 2010 in Argentina (per Patricia González). This individual was resighted on 17 occasions in Georgia, and was seen each spring during the 2013, 2015, and 2016 seasons. Photo by Fletcher Smith. The coast of Georgia plays a significant role as a migratory staging area for the rufa population of red knots. The population experienced a precipitous decline over the past 40 years leading to its eventual listing as “threatened” under the U.S. Endangered Species Act. 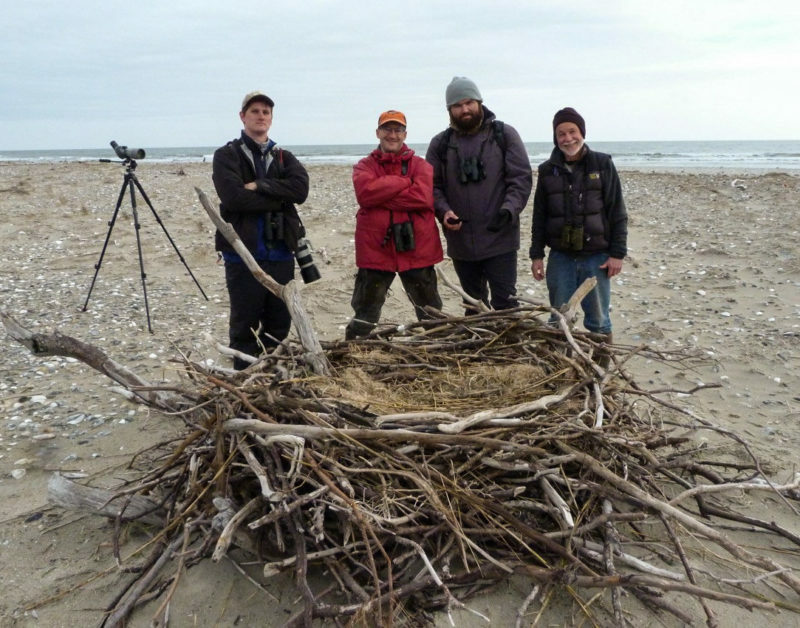 Although researchers have worked for decades with the portion of the population that stages along the mid-Atlantic coast, much less has been known about birds using coastal Georgia. During the fall of 2017, CCB, along with project partners the U.S. 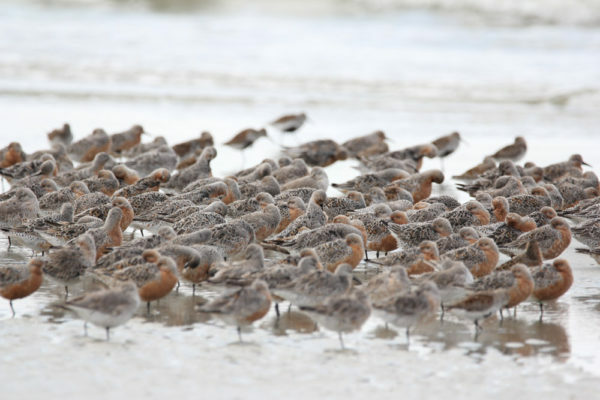 Fish and Wildlife Service, U.S. Geological Survey, Georgia Department of Natural Resources Non-game section, and Manomet, Inc., released a report entitled “Investigating Red Knot Migration Ecology along the Georgia Coast.” The report summarizes a multi-year effort to examine knots using Georgia primarily during spring migration. Red knot flock roosting on a beach near Brunswick, Georgia. Knots spend most of their time in Georgia alternating between resting and voracious feeding. Photo by Fletcher Smith. Fletcher Smith of CCB led fieldwork that focused on the chain of barrier islands within Camden, Glynn, McIntosh, Liberty, Bryan, and Chatham Counties. 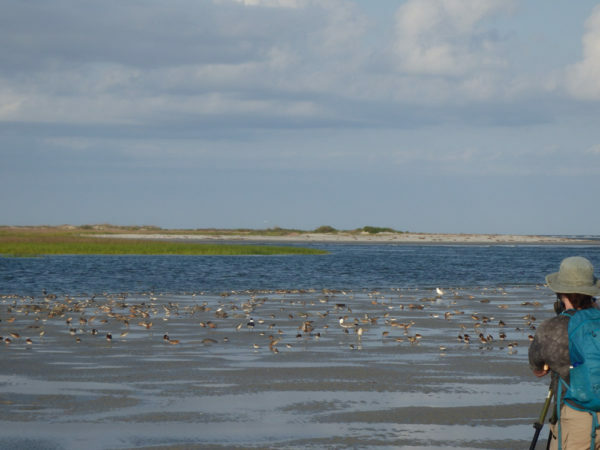 Seven barrier islands were selected for intensive resighting efforts during the 2016 season: Gould’s Inlet, Pelican Spit, Rainbow Beach (on Little St Simons Island), Sapelo/Cabretta/S. Blackbeard Island, Ogeechee/Raccoon Key Bar, Little Tybee/Beach Hammock, and Tybee Island/Bar. 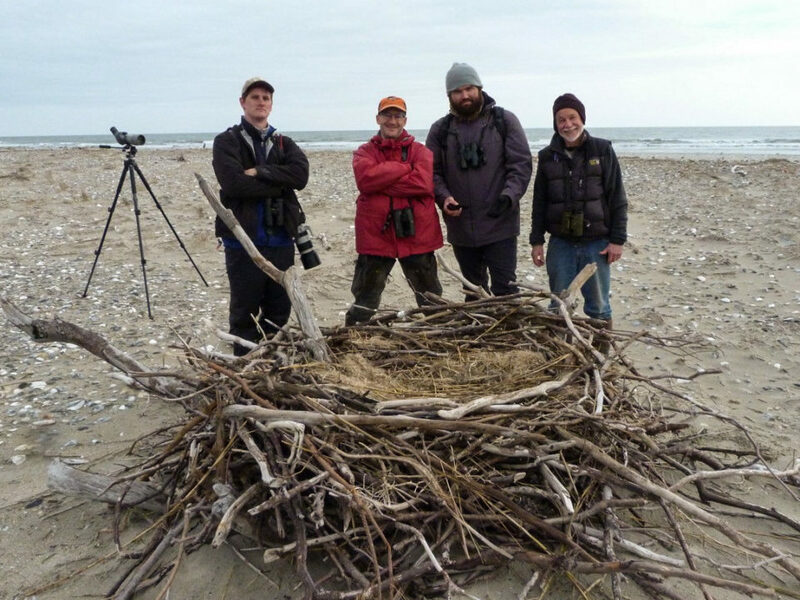 The CCB crew and volunteers surveyed knots within these specific sites and scanned birds for coded leg flags. 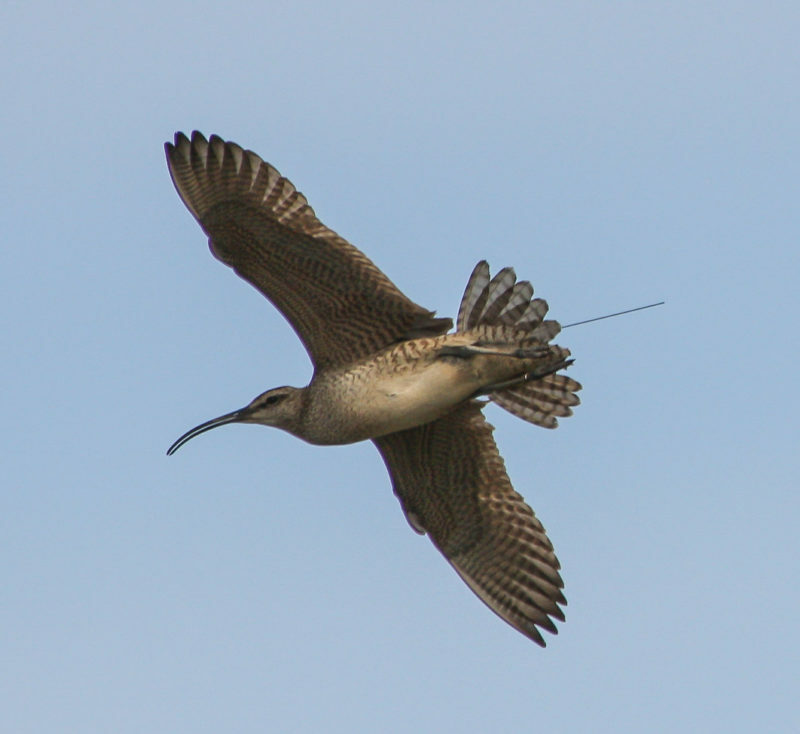 During the spring of 2016 alone more than 43,000 knot encounters were recorded and more than 10,000 of these were scanned for flags resulting in the identification of 1,255 flagged birds. A total of 158 marked to unmarked ratios were recorded during the season, with an average of 3.8% of birds encountered throughout the spring being marked. Jim Lyons of USGS evaluated encounter histories within a Jolly-Seber modeling framework to estimate the population size using the Georgia coast and the duration of stopover. CCB technician Beth MacDonald resighting red knots on a sand flat near Tybee Island, Georgia in spring 2016. CCB and volunteers gathered data from the most critical stopover locations on the Georgia barrier island chain. Photo by Fletcher Smith. 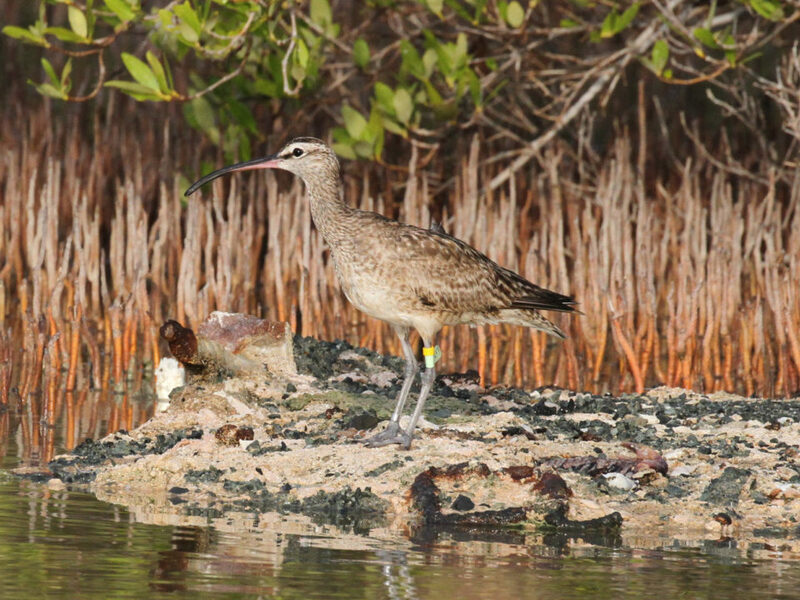 The two most significant findings of the study include the number of birds using the Georgia coast during the spring and how long these birds are staging. During the spring of 2016, just under 12,000 total knots were believed to have used Georgia as a stopover or staging area. The current estimate of the rufa population is 42,000, suggesting that more than 25% of the population was present in Georgia during the spring. 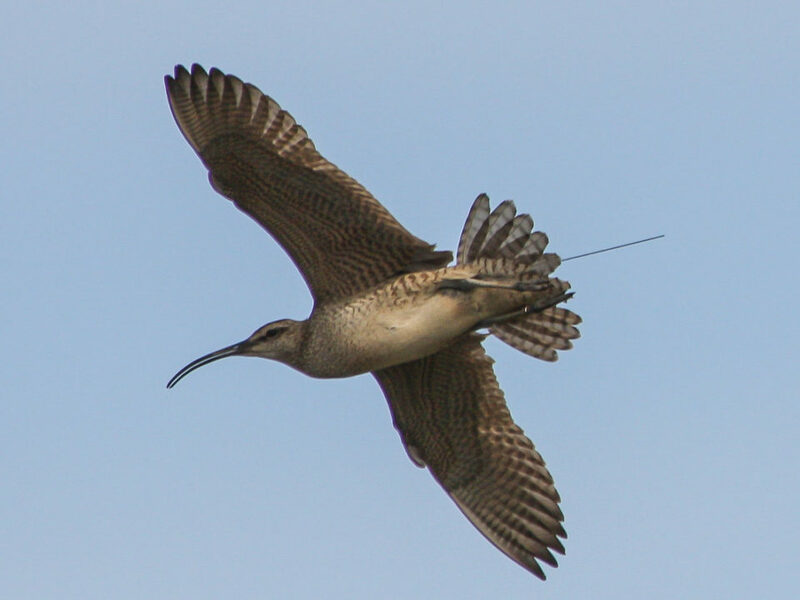 A model-based estimate of stopover duration during the 2013 spring season was 3.4 weeks, suggesting that a portion of the birds are using the Georgia coast for an extended period and likely flying from Georgia directly to the breeding grounds in the Arctic. These results follow a recent paper published in the Journal of Wildlife Management and led by Jim Lyons that evaluates the use of the Georgia coast by the rufa population during fall migration and estimates that more than 23,000 birds staged there in 2011. 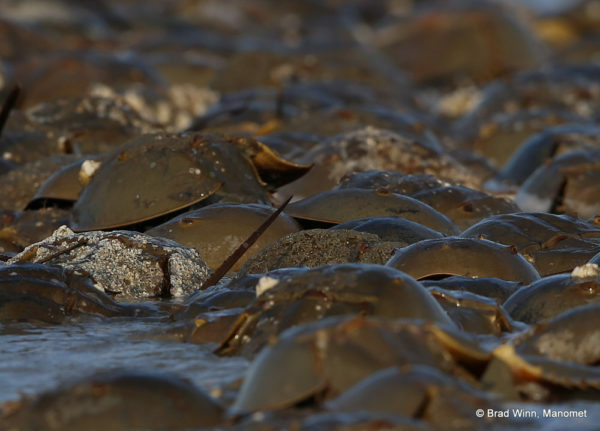 Horseshoe crabs spawning along the Georgia coast. Photo by Brad Winn/Manomet, Inc. 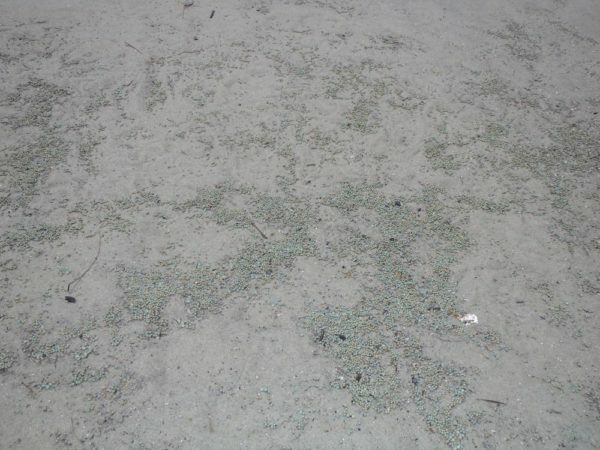 Horseshoe crab eggs on the surface of a Georgia sand flat. Concentrations of prey such as HSC eggs and Donax and Mulinia bivalves in Georgia are critical for the knots to put on fat for the Arctic breeding season. Photo by Fletcher Smith. 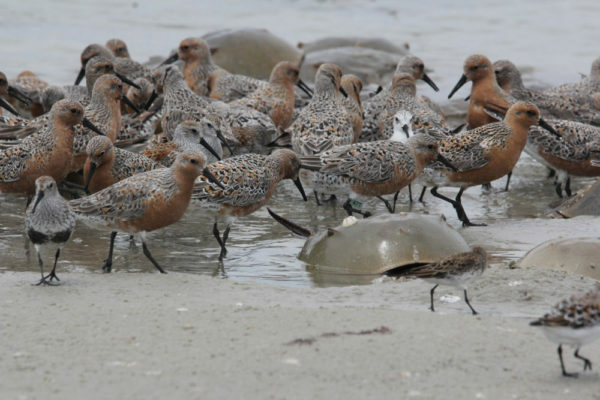 Red knots feeding amongst spawning horseshoe crabs. Photo by Perri Rothemich. 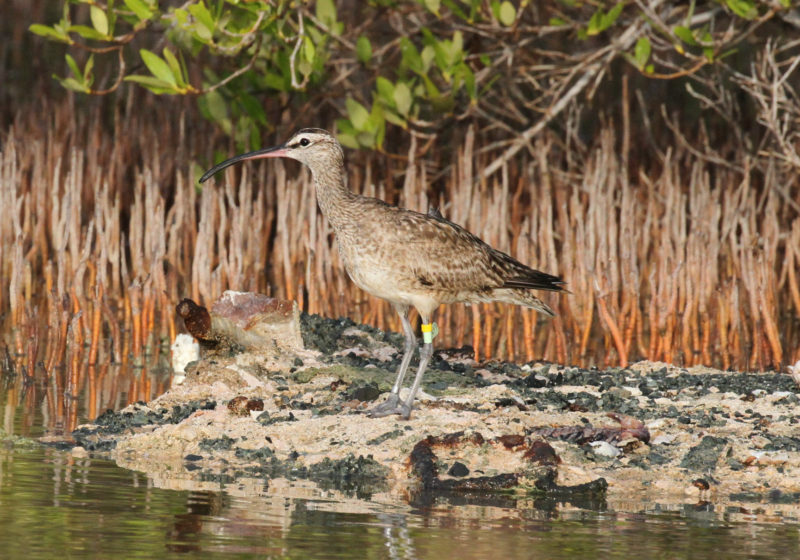 Migratory staging sites play a critical role in the life cycle of many shorebird species and maintaining conditions that allow for rest and refueling is an important conservation priority. The Georgia coast appears to be a key node within the broader network of conservation sites for the rufa population. Funding and support for the project was provided by the U.S. Fish and Wildlife Service, Gulf Power and Southern Company’s Power of Flight Program through National Fish and Wildlife Foundation, the U.S. Geological Survey, Manomet, Inc., The University of Georgia’s Center for Research and Education at Wormsloe, the National Park Service, The Nature Conservancy, the staff of St. Catherine’s Island, Little St. Simons Island, Ossabaw Island, and Cumberland Island, the staff of Bandedbirds.org, and The Center for Conservation Biology. This study would not have been possible without the significant effort of all of the researchers tagging Red Knots along the flyway.